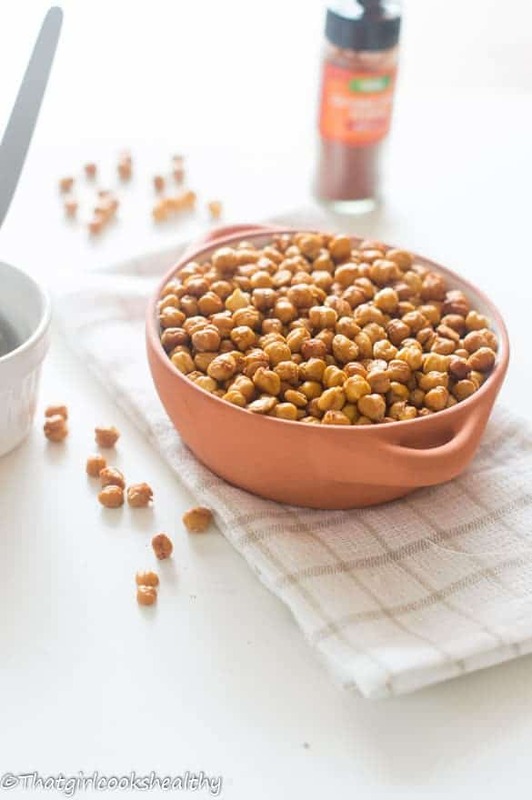 Easy roasted cayenne chickpeas recipe – little balls of chickpeas boiled and baked in the oven to a crispy crunch then seasoned with cayenne pepper. 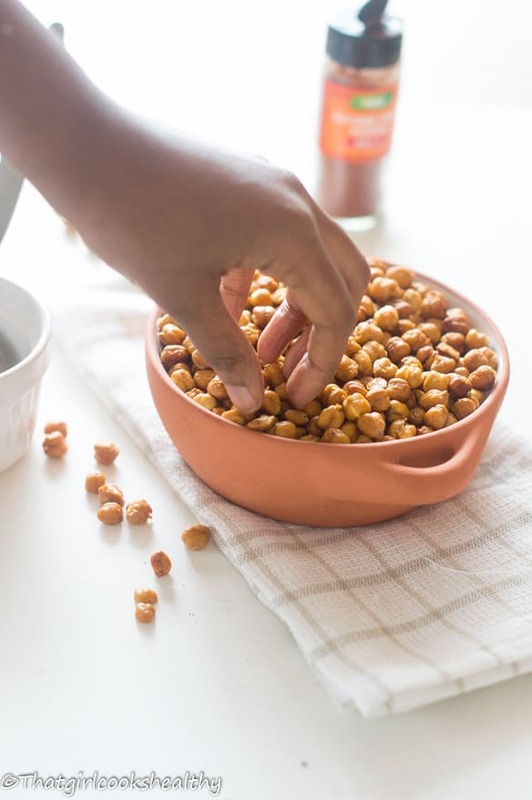 I’m so excited to share this very very easy roasted cayenne chickpeas and if you love eating copious amounts of snacks throughout the day. 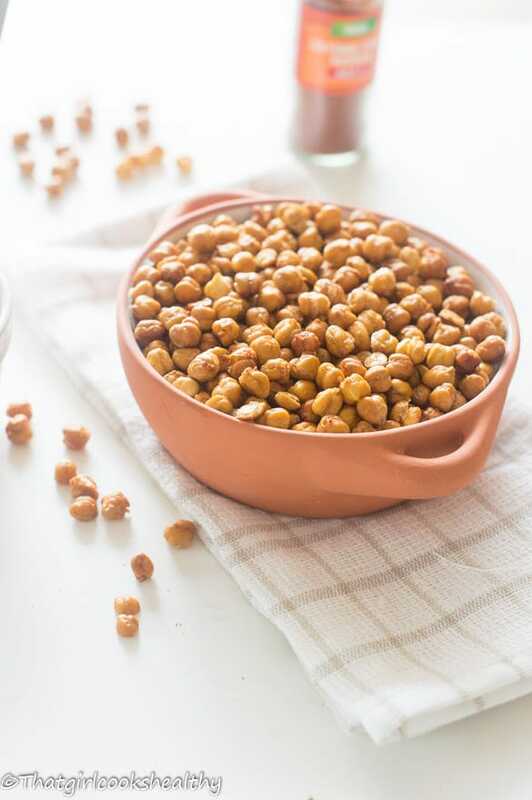 Then you will be please to know you can eat a moderate amount of roasted chickpeas without the guilt trip – win win!! It’s so easy to see why people are so malleable and end up consuming unhealthy food. Just take a trip to your local supermarket, walk down the bakery aisle and see the endless amounts of unhealthy treats that are to be had. I know snacks constitute our daily in take and for some this can be problematic in the sense that they are eating the wrong type of food (think unhealthy saturated snacks). Snacking within it’s self isn’t a bad thing because nibbling on some carrot stick is a lot more healthier and less damaging to one’s health then say eating a dozen ring donuts. Therefore, the problem is the type of things we snack on. We need more nutritious options and less cholesterol raising foods as snacking options, especially the UK’s astronomical obesity rate – there needs to be a change! 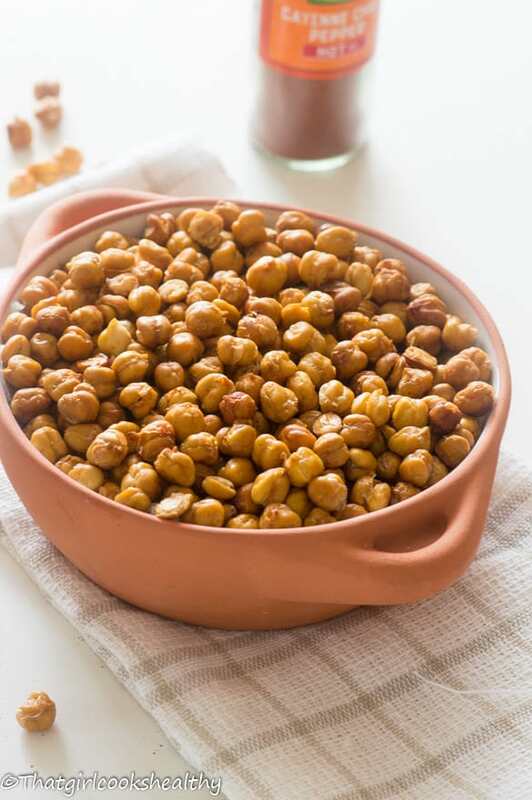 Use cooked chickpeas – to roast chickpeas they first of all need to be cooked already. You can do this by pressure cooking (if you have one) to hastened the cooking time. A pressure cooker is the quickest method to prepare in there dried form. One par with that would be to canned chickpeas, drained and precooked for ease. 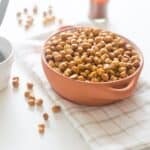 Adding your condiments – The chickpeas should be completely dry (blot if needed) before adding your spices and coconut oil .This is so that the chickpeas are evenly coated with the oil and seasoning, enabling them to roast more thoroughly. Use parchment paper – to prevent sticking use a non stick paper such as parchment paper NOT foil. Roasting/texture – Let the chickpeas roast in the oven, keep an eye on them in case they darken/burn quickly. The texture should be hard and crunchy. Do a taste test to determine it’s readiness! As a gym enthusiast I like to carry a small bag of these in my bag and nibble on that after going strength exercises. It’s so handy that I have them to hand and not have to wait until I get home to have my protein fix. Another great thing about this recipe is it’s allergy friendly, they make a great nut free snack that’s crunchy and so more-ish too. Just like popcorn you can jazz them up with anything sweet, spicy or even savoury. 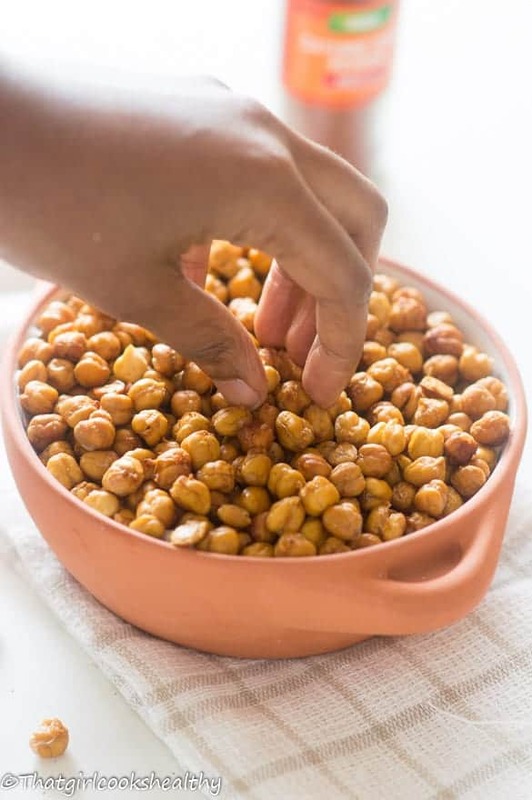 Place the chickpeas in a large bowl then coat evenly with the cayenne pepper, pink salt and coconut oil. Line a baking tray with parchment paper and spread the cooked chickpeas onto the tray, being careful not to overcrowd. Roast for 30-40 minutes until golden brown and crunchy. Don’t forget to check the periodically, rotating the chickpeas so they cooked evenly and don’t burn. Allow to cool before dusting with additional cayenne before serving accordingly. Store the remainder in an airtight bag. This sounds like a perfect snack!! I can’t wait to try this recipe! Happy to hear it meets your approval. I have seen a number of spicy chickpea recipes. The cayenne is a perfect spice. These would be a wonderful healthy snack. I am so crazy about chickpeas lately.Cayenne chickpeas sounds amazing. Yum! We are currently having the European soccer championship games and often have a house full of friends – so this is awesome! 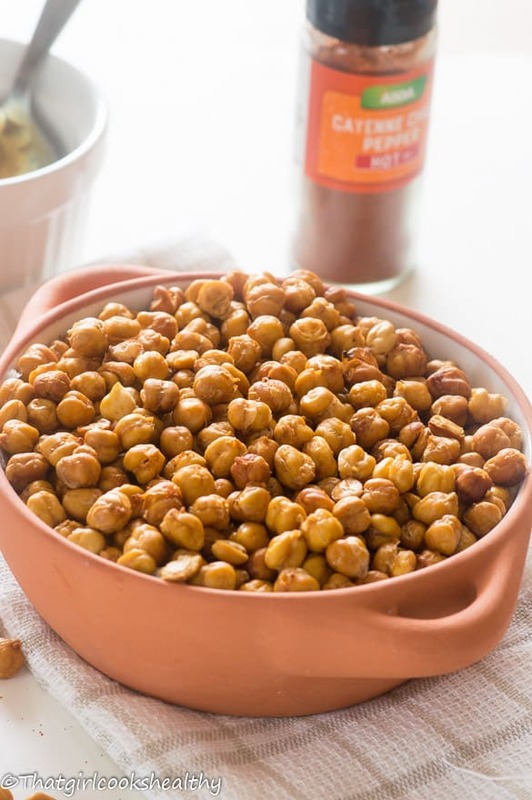 We love Chickpeas and I have been thinking of roasting them for a snack for a while. But never tried it. Your recipe is a wakeup call to do it sooner. Thanks Sandhya, I highly recommend giving my recipe a try.